Navajo "WP Rogers" Pictorial Double Saddle Blanket, c. 1925, 31" x 45"
For over three centuries the Navajo have been weaving blankets, and those crafted during the last 100 years are known as saddle blankets. The earliest saddle blankets were created in the 1870s and they come in a variety of sizes, colors and thickness. As a leader in Navajo textiles and pueblo pottery, Mark Sublette Medicine Man Gallery offers one of the largest inventories of Native American art and jewelry for sale in the country. Gallery owner Dr. Mark Sublette, an expert in Navajo weavings, has spent over a decade acquiring a collection of weavings that will be on show and for sale at the gallery’s Santa Fe location from July through September. Navajo Double Saddle Blanket, c. 1920, 58" x 33"
Titled Navajo Saddle Blankets 1870-1930s, this collection reflects the vast and innovative designs of the golden era of Navajo saddle blankets. 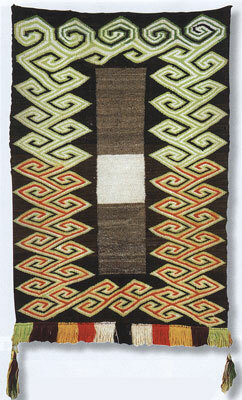 From natural handspun churro wool to Germantown, Navajo saddle blanket design influenced American and European modern artists of the early-to mid 20th century. 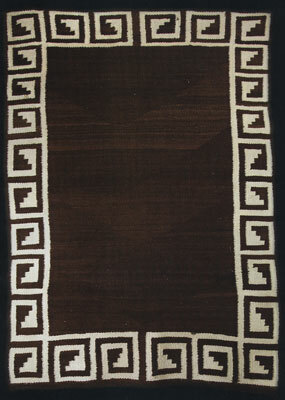 Navajo Double Saddle Blanket, c. 1900, 50" x 34"
This one-time show reflects Sublette’s own aesthetics in Navajo weavings, many which are simple in design. Sublette began collecting the blankets for the shear enjoyment they brought him. He amassed such an array of quality textiles by actively seeking pieces from collectors, estates, and even other dealers. Navajo Double Saddle Blanket, c. 1920, 49" x 32"
Among the highlights of this sale is a double saddle blanket with the initials W.P. Rogers that was commissioned for actor-humorist Will Rogers by his wife. 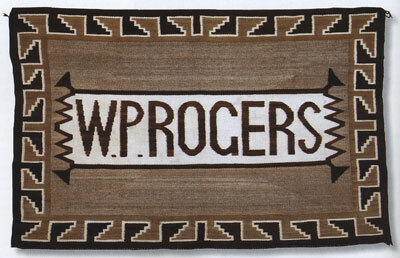 Rogers, who knew his way around a horse, must have appreciated the beauty a great saddle blanket added to his favorite mount. “It’s a great example of the type of people who were interested in these pieces,” says Sublette. 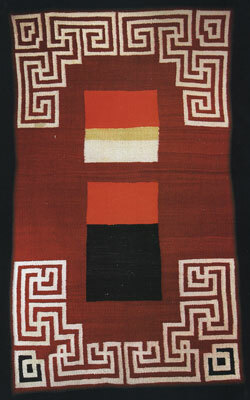 Many of the artists from the modern and pop movement either collected Navajo weavings or recognized their unique design features, adds Sublette. For instance, minimalist artist Donald Judd, whose abstract sculptures bring millions, collected Navajo weavings. 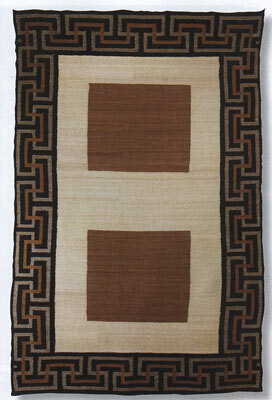 Navajo Double Saddle Blanket, .c 1920, 53" x 34.5"